Fans of princesses and superheroes, rejoice! 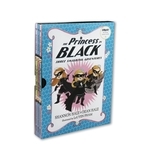 Here comes a handy boxed set offering an irresistible introduction to Princess Magnolia and her monster-fighting alter-ego, the Princess in Black. Humorous and action-packed, these early chapter books written by Shannon and Dean Hale and illustrated by LeUyen Pham are a hit with young readers. Look out for inconvenient monster alarms, royal birthday parties, and a case of monstrous cuteness in a collection that includes The Princess in Black, The Princess in Black and the Perfect Princess Party, and The Princess in Black and the Hungry Bunny Horde.